Is Facebook’s Graph Search a Giant Killer? Will Facebook’s “Graph Search” be a threat to Google, LinkedIn, Yelp, or Foursquare asks a question on Quora? No, No, No and Definitely Not. Yet. Beneath the obvious user delight, Facebook is betting a lot on Graph Search’s core ability to connect people with what they’re looking for accurately and immediately. And obviously as the middle man, they stand to gain. Fair enough. But will Facebook’s imminent functionality be a threat to well established vertical searches like Google, Yelp, LinkedIn and Foursquare? All of the four kinds of search you can do today: Photos, People, Places and Interests, bear commercial implication. But the most immediate remain People and Places, which as bloggers speculate may pose a threat to Yelp, Foursquare, Google (Places) and LinkedIn (People). So, let’s take simple examples and compare Facebook Search with the other four searches. 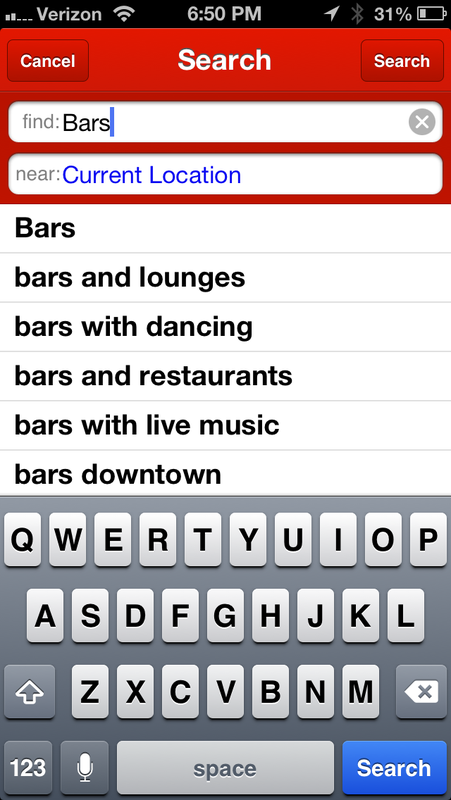 I started with a simple search for “bars,” something I presume will be a common search on any local product. Here’s what I got with Facebook. 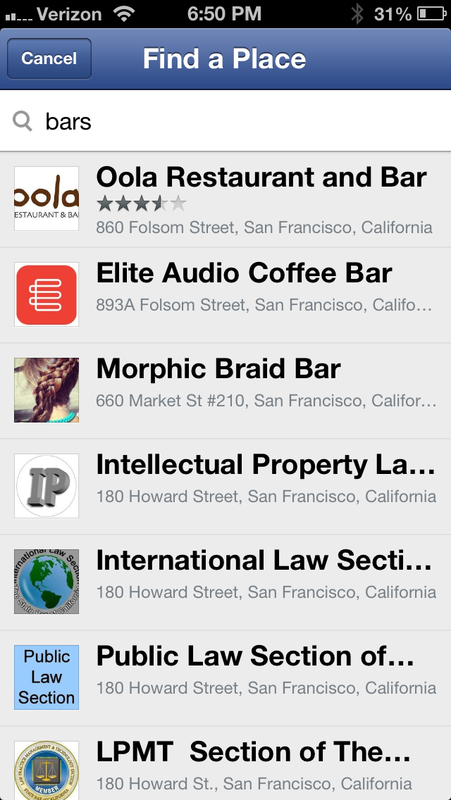 For starters, along with actual bars it also pulled up law and bar associations or offices which was a bit odd. Now try the same with Yelp and you see how right away, they try to segment that query into the different types of bars you’re potentially searching for. 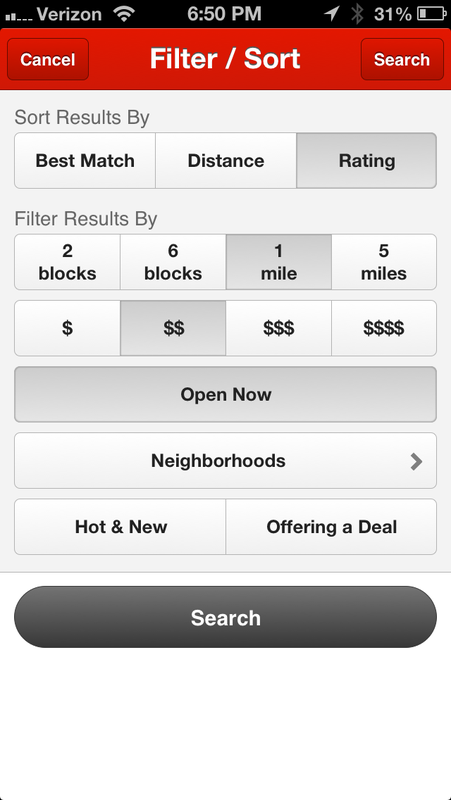 Once you get a set of results, Yelp then allows you (and this is the most useful feature on yelp currently) to convenience sort by “rating,” “proximity,” “price,” “open now,” or even better by neighborhoods. I’ve gotta tell you; if you go out often, this filter is magical. But again, the filter is by utilitarian ratings by foodies and not by friends around you. More on that in just a second. 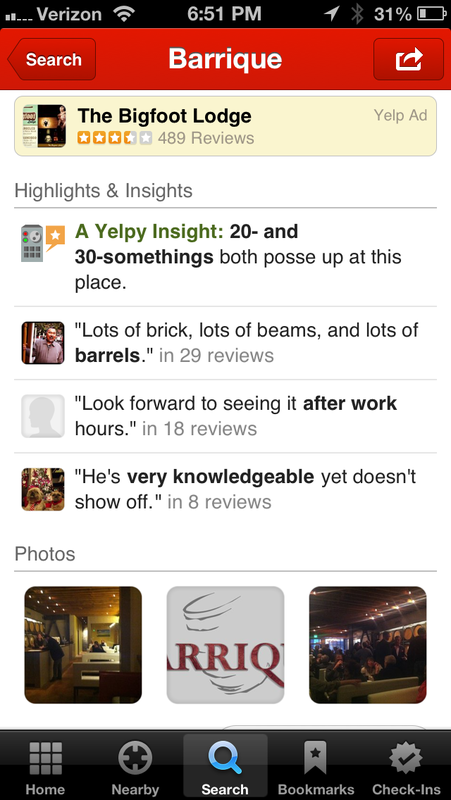 But before we leave Yelp, the third most useful feature on Yelp is their surfacing key elements of the review. So you’re at a restaurant and you’re wondering what’s the best thing on the menu. In days past, you’d have had to ask the person serving you but now you can rely on “the wisdom of an expert crowd” what’s the best food here and it works. Like magic. Back to the topic of friends which is Facebook’s biggest competitive advantage. If you do wanna take into account which restaurants your friends are frequenting (ignoring the fact that expertise is the key), then try Foursquare. 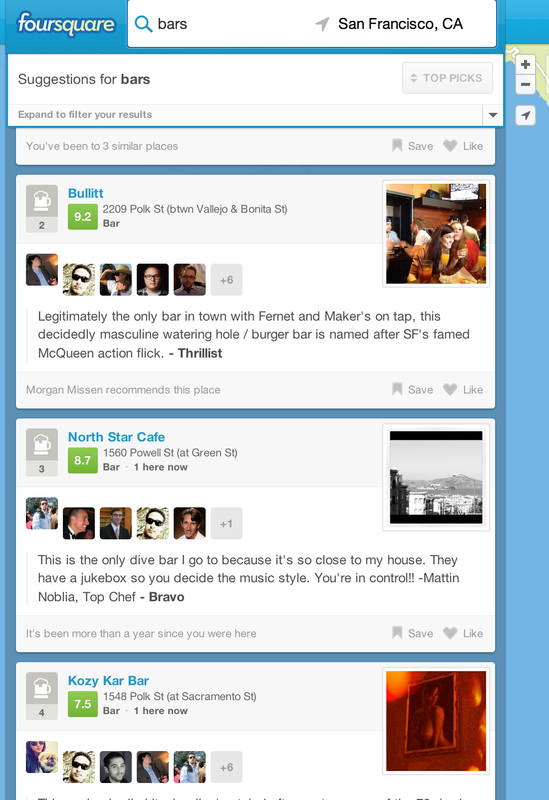 The first thing you’ll notice yet again is the structured data (categories like Bar, Sports Bar, Salon) right up front (similar to Yelp) that Foursquare now provides you; though not as in depth as Yelp, can still be a tad useful. Digging deeper through the results, you’re gonna find them sorted by Foursquare’s own proprietary “Zagat number” that they conjure based on multiple data points. 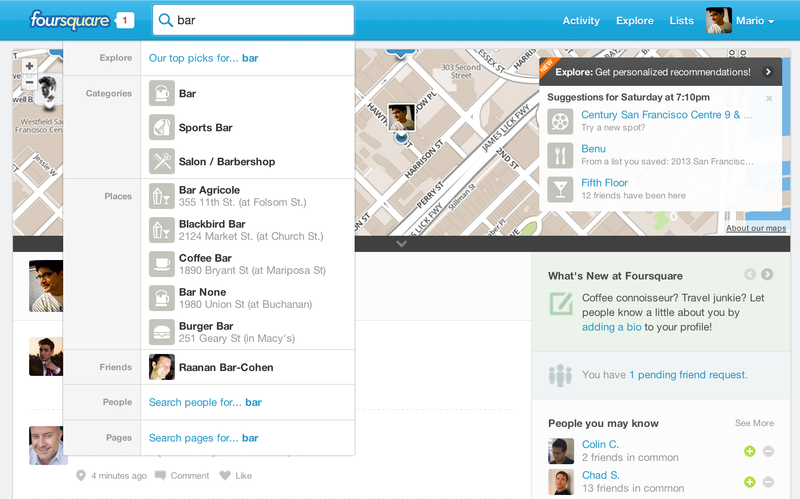 Foursquare comes up with its score by looking at tips left by users, likes, dislikes, popularity, check-ins and it also weights signals more heavily for local experts. They also show you a self-selecting group of folks who you know. Chances are most of these folks are more prone to bar hop than your other friends. But still Yelp really nails it with their community that they have nurtured for many many years who continue to write meaningful reviews that makes a world of difference when it comes to local search. While on the topic of a Zagat number, Google recently bought restaurant ratings site Zagat which now powers their Google Local ratings. 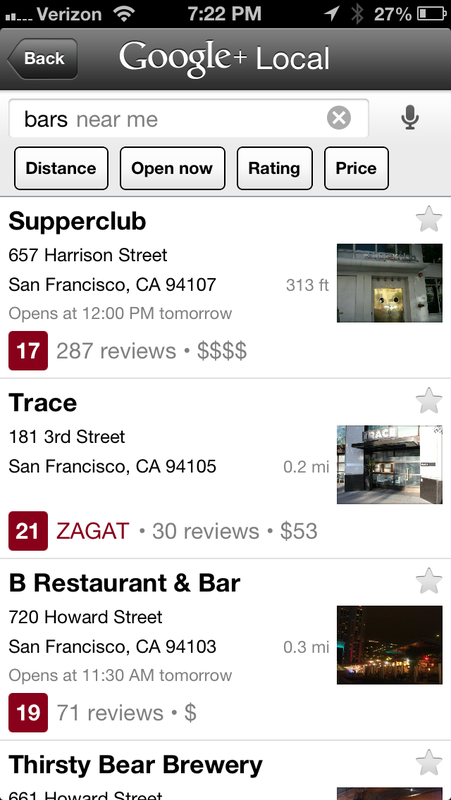 Zagat which originally started off compiling restaurant ratings of the Zagat’s friends, does something very similar to Yelp and the model here is yet again – expertise. Shifting gears to people search, Facebook’s people search is three years after LinkedIn launched its faceted people search. I know because I helped launch it at TechCrunch Disrupt where product manager Esteban Kozak demoed it right before CEO Jeff Weiner went on stage. (Disclosure: I no longer work at LinkedIn and don’t own any stock either) My mind was blown when I first saw what we could do with faceted search on LinkedIn both from a user experience perspective and I’m sure recruiters have found even more value from it. Take a look at this demo video we shot in 2009 that shows you the plethora of signals a site like LinkedIn uses to hone in on the right professionals in a search. Easier said than done, and much like with Yelp, these signals have been gathered over many many years and such a search isn’t something you can turn on willy-nilly. In all four instances the quality of Facebook’s search is insipid today compared to the robust community based expertise that the four sites have either built or bought . Now granted there are many things Facebook could do to build or buy their way into each of these verticals but the key point is that strength in local search across People and Places is not “friend” related, but rather “expertise” dependent and it takes years to build that. And frankly, I’d go with the critical reviews from experts in these fields and that’s an area that Yelp, Foursquare, Google and LinkedIn have Facebook beat.